Tsurumi America's new website combines its informational site and online store. Tsurumi America has launched a new corporate website with a new updated design, which combines its informational site and online store into one website for improved user functionality and better access for dealers. 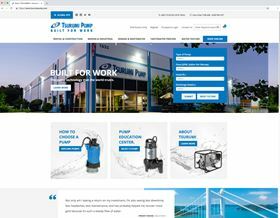 Tsurumi has also updated the search capabilities on the site, enabling customers to search for a particular pump based on one of four criteria, including: the type of pump, the flow (gallons per minute), the required pressure (feet) and the discharge size (inches). This is one of the critical new main features as it allows customers to save valuable time finding the right pump for the application. All technical drawings and specifications are now included in the product details and include dimensional drawings, sectional drawings, product literature and performance curves. Another significant upgrade to the site is a video section that offers current product videos, allowing users to see a visual demonstration of various Tsurumi products. The site’s improved capabilities include a live chat feature for customers to contact Tsurumi’s inside sales team, making them even more accessible to their customers. Tsurumi Pump sets up a remote warehouse in Woburn, Massachusetts to better serve the US northeastern region.